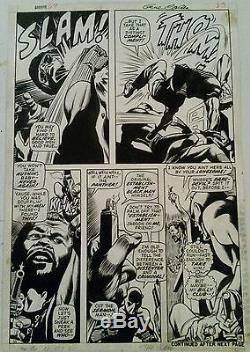 DAREDEVIL and THE BLACK PANTHER teamed up in Daredevil #69 (1970) and this is page 18 from that issue by GENE COLAN and SYD SHOES, two of the greatest comic artists of Marvel's early years. Image measures 10 by 15 inches and the board is just under 11 by 16. 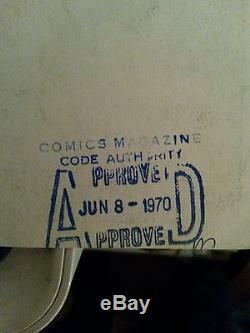 Condition: pencil residue on back; Comics Code Authority stamp on back that dates this as June 1970, and was no doubt drawn days or weeks before that. Tiny corner torn off bottom right but it does NOT affect the artwork or Marvel paste-ups. This is page 18 of the story and page 23 if you add in the ads. GENE COLAN was famous among comic fans for his art on DAREDEVIL, TALES OF SUSPENSE, CAPTAIN AMERICA, DOCTOR STRANGE, CAPTAIN MARVEL, THE AVENGERS, BATMAN, NIGHT FORCE, TOMB OF DRACULA, EERIE, BLAZING COMBAT, WONDER WOMAN and many other titles. SYD SHORES goes back to Marvel's Golden Age (as does Colan) and drew or inked zillions of Marvel characters, like Two-Gun Kid, Black Rider, and his inking on Jack Kirby was well known to be among the best. All payments must be in US dollars. I have been a professional comic grader since 1983, have written about comics for various publications Comics Journal, Comic Book Marketplace, Comic Book Artist, Comics Retailer, etc. Have worked in comic book shops and distribution warehouses and co-edited the Andromeda distributor catalogue for a time. 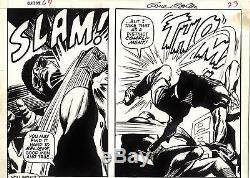 The item "GENE COLAN/SYD SHORES Daredevil #69 SIGNED 1970 Marvel Comics with BLACK PANTHER" is in sale since Sunday, September 18, 2016. This item is in the category "Collectibles\Comics\Original Comic Art\Interior Pages". 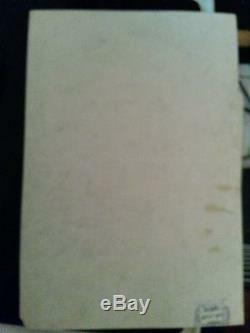 The seller is "cdsz" and is located in Toronto, Ontario. This item can be shipped to United States, to Canada.